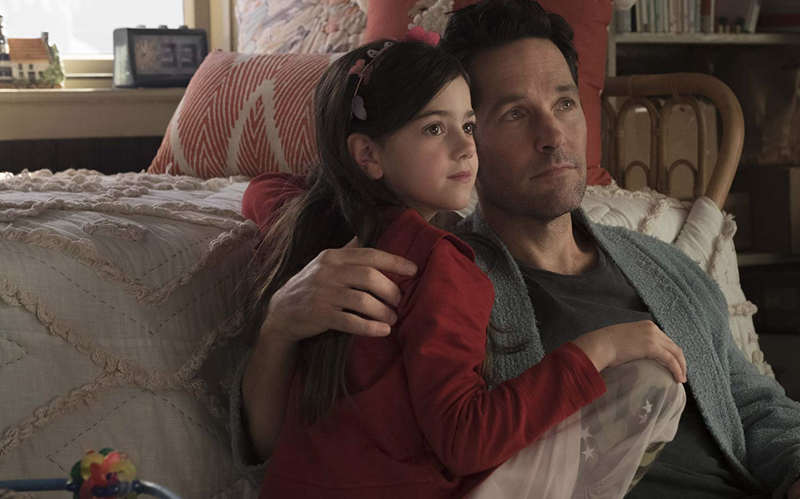 2015’s “Ant-Man” was something of an anomaly in the Marvel Cinematic Universe with its own loose, breezy rhythm, and that’s what made it such a delightful breath of fresh air. It took itself seriously enough, while mostly remaining in the now and not putting too fine a point on setting the table for future Marvel movies, and wasn’t above having fun and laughing at itself as an exceedingly likable, visually inventive, smaller-can-be-better entertainment. “It’s about damn time,” Hope Van Dyne remarked at the end of the film when she got a sneak peek at a prototype suit she would don as The Wasp, and the prospect of a sequel was inevitable and necessary for the MCU to finally recognize a fierce, fully capable woman in the title. 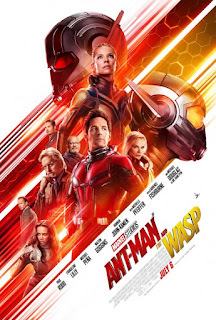 The twentieth installment in the Marvel Cinematic Universe, “Ant-Man and the Wasp” is the follow-through of that post-credits scene, and while the film is heavily plotted, the level of smile-inducing fun has not shrunk in size and the goofy but earnest tone is still appealing. 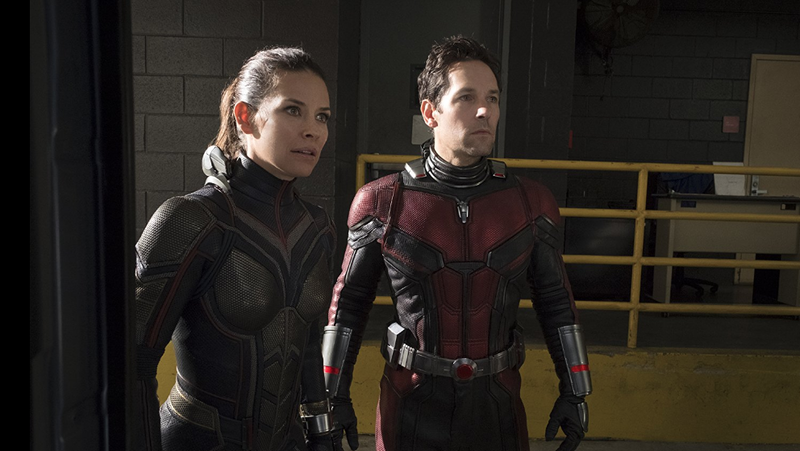 Having been sentenced to a two-year house arrest for partaking in the Avengers’ airport tarmac battle in Germany (see 2016’s “Captain America: Civil War”), former burglar Scott Lang/Ant-Man (Paul Rudd) tries to keep up his good behavior as he’s only days away from the end of his probation. Going stir-crazy when he’s not playing drums, tearfully reading “The Fault in Our Stars,” and entertaining daughter Cassie (Abby Ryder Fortson) in an indoor cardboard maze, he tries reaching out to Hank Pym (Michael Douglas) and Hope (Evangeline Lilly), who have gone into hiding. Once he receives a message of sorts from Janet van Dyne (Michelle Pfeiffer), Hank’s wife and Hope’s mother, in his head through “quantum entanglement,” Scott is enlisted by Hank and Hope to rescue Janet, the original Wasp who’s been lost in the so-called Quantum Realm for 30 years after stopping a missile attack. Having built a quantum tunnel, the father-and-daughter team now has the technology to return Janet from subatomic size. Their mission runs into a few snags when black marketeer Sonny Burch (Walton Goggins) and the stealthy, intangible Ghost (Hannah John-Kamen) separately want a component of Hank’s technology, while Scott tries evading the feds and S.H.I.E.L.D. Agent Jimmy Woo (Randall Park), who think he’s still home wearing his ankle monitor. 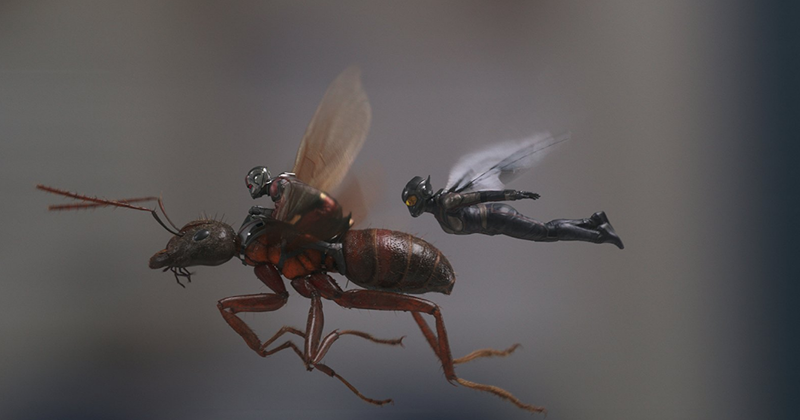 Nimbly directed again by Peyton Reed and co-scribed by a quintet of screenwriters—Chris McKenna & Erik Sommers (2017’s “Spider-Man: Homecoming”) and Paul Rudd & Andrew Barrer (2014’s “Haunt”) & Gabriel Ferrari—“Ant-Man and the Wasp” recaptures everything that “Ant-Man” did so well without merely going through the motions and still keeping the stakes more personal and earth-bound. Whereas the first film felt zippier and more focused, this one does admittedly meander and spin its wheels at times, as “the component”—really, it’s just a McGuffin—keeps turning into a keep-away game of hot potato with so many ancillary characters. 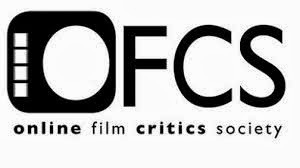 In the grand scheme of things, however, director Reed finds a sweet spot along the way with an irresistible sense of humor, a sincere heart, and imaginative action. Paul Rudd still makes for an amiable and identifiable everyman hero, two qualities in Rudd’s reliable wheelhouse as Scott Lang/Ant-Man. When Hank and Hope speak convoluted scientific jargon, Scott is the audience surrogate, asking, “Do you guys just put ‘quantum’ in front of everything?” Rudd’s scenes with Abby Ryder Fortson, as daughter Cassie, are sweet, and it’s refreshing to find a friendly relationship between Scott and his ex-wife Maggie (Judy Greer) and her husband Paxton (Bobby Cannavale). A very funny sight gag involves Scott shrinking down to the size of a kid at an elementary school due to a malfunction with his new suit and getting caught by a teacher, and Rudd also handles more physical comedy well when Janet overtakes Scott’s body, like a one-sided “Freaky Friday” moment. Receiving equal billing as Hope/The Wasp, Evangeline Lilly solidifies herself as a radiant, eye-catching star with a coolness and charm. She is a badass in and out of her costume, getting to do much more of the fighting and rescuing this time, and there is a certain amount of emotional heft in Hope wanting to reunite with her mother after all this time. 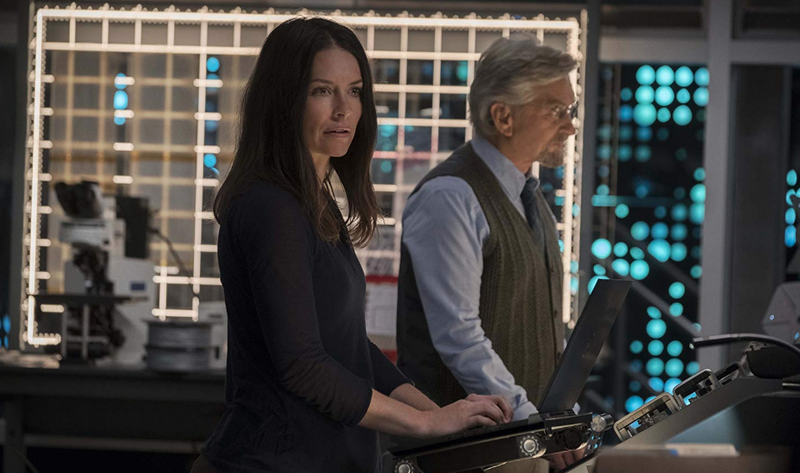 Michael Douglas is as enjoyable to watch as he was before as Hank Pym, stubborn but also warm, and Michael Peña is a burst of scene-stealing energy each time he comes on screen as ex-con sidekick Luis; his breathless recap during an interrogation, told again like a “Drunk History” episode, is enormously funny. T.I. and David Dastmalchian, as Luis’ X-Con security business co-workers Dave and Kurt, return, adding to the comic relief, particularly when they’re given a “truth serum,” and Randall Park is hilarious as Agent Jimmy Woo who’s tasked with keeping tabs on Scott. That Michelle Pfeiffer doesn’t get as much screen time playing Janet van Dyne as she deserves is a disappointment, but when she’s on screen, she hits the emotional marks. 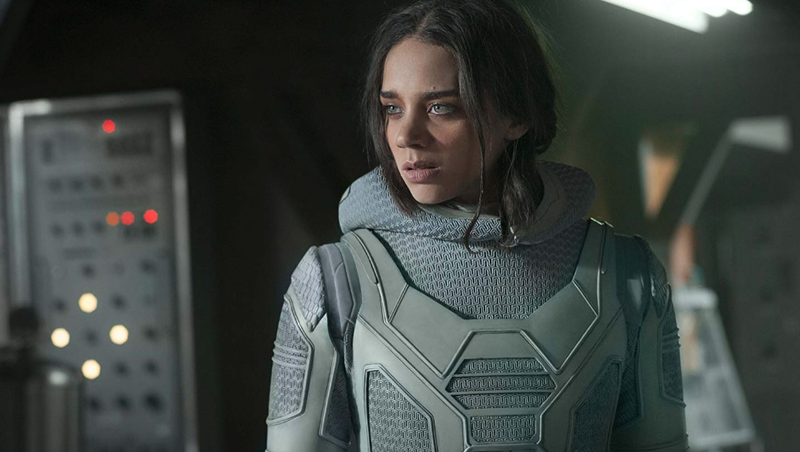 Hannah John-Kamen (2018’s “Ready Player One”), as the mysterious Ava/Ghost, is compelling without necessarily being a villain; although she has support in Hank's old colleague Dr. Bill Foster (Laurence Fishburne), she wants to inflict pain upon others because she's tired of feeling pain herself. Finally, it seems like lazy casting for Walton Goggins to play another baddie, but he at least doesn’t seem bored here with a glint in his eye as Sonny Burch. In spite of needless overplotting, “Ant-Man and the Wasp” is still a fair amount of high-spirited fun, carrying over the good will of its predecessor. Without the fate of the world at stake, it feels like a lighthearted snack and side adventure after the grim consequences of “Avengers: Infinity War” (though it is set before that film). The literally small-scale effects are still inspired, including a running gag where Hank makes his laboratory building portable and shrinks it down to a suitcase on wheels. A kitchen-set melee between the Wasp and Sonny Burch’s henchmen is thrillingly staged, as she dodges a large butcher knife in small size and blocks the door with an enlarged salt shaker. A climactic car chase is also anything but standard, involving a giant PEZ dispenser, cars shrinking to Hot Wheel size, San Francisco’s winding Lombard Street, and a flatbed truck being used as a scooter by a big Ant-Man. 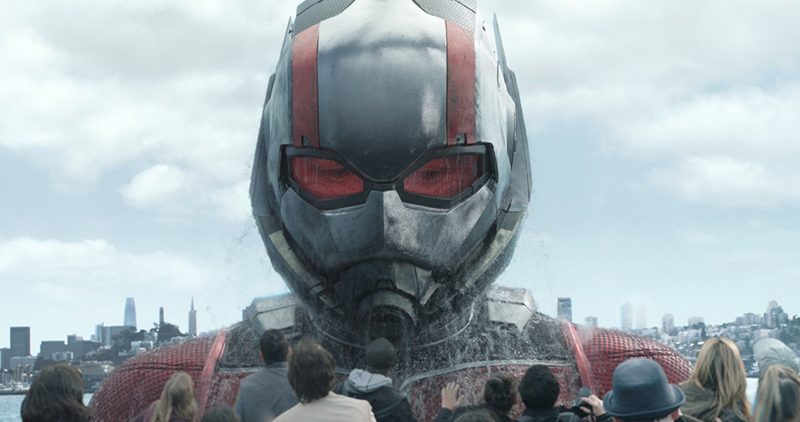 Marvel fans will already know to stay in their seats until the final credits are done rolling, and rest assured, the stinger is worth the wait as connective tissue to “Avengers 4.” Luckily, it’s not the only reason to see “Ant-Man and the Wasp" when just two of the main selling points are in the title.